Can I wax SunTek Paint Protection Film Matte? Some waxes will add a level of gloss to PPFMatte. However, there are waxes on the market specifically for matte finishes. Waxing is still recommended for added protection. Can I take my car through a pressure wash with SunTek Paint Protection Film? It is best practice to wait 3 days before washing your car. While hand washing is preferred, you can use a pressure wash, but be careful near edges as the pressure water can lift the edge. Can “coatings” be applied to SunTek Paint Protection Film? Ceramic coatings are approved for use with our Paint Protection Films when applied over the surface of the product. Ceramic coatings create an additional barrier for solvent and water penetration while not negatively impacting the performance or self-healing of our Paint Protection Film. This application will not void your warranty. If there is a stain that won’t wash off, what do I do? If a stain will not wash off with a regular car wash, you can apply isopropyl alcohol to a microfiber towel and clean the stain, if that does not work you can use a small amount of lacquer thinner. If the stain remains we would recommend you use a mild-abrasive wax and polish the surface of the film to restore the original appearance. Polishing/buffing of the film is a great way to remove contaminants from the surface, however this process should be limited to as-needed or once every 12- 18 months. An example of a mild-abrasive wax would be Turtle Wax Renew RX Polishing Compound Light to Medium Cleaner. Can SunTek Paint Protection Film be applied over repaired/fresh paint? 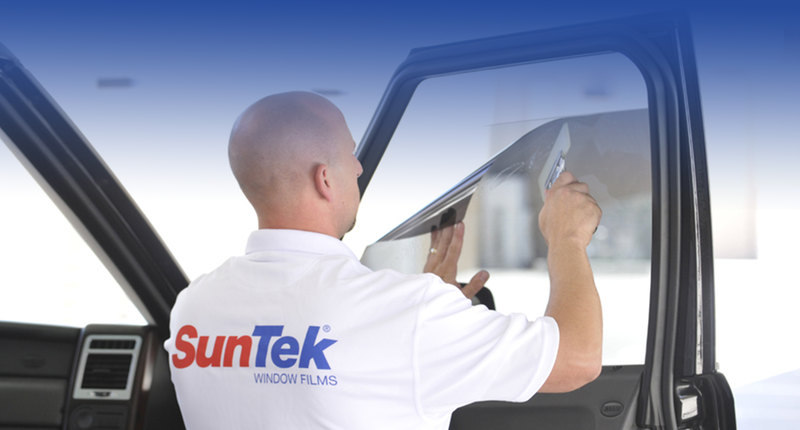 SunTek Paint Protection Film is designed and warrantied when applied to original paint. Issues with aftermarket/repaired paint are not warranted by SunTek. If you choose to still have SunTek Paint Protection Film installed over fresh paint, the common waiting period is 30 days for the paint to outgas. Should I wax my car prior to SunTek Paint Protection Film installation? It is not recommended to apply wax or any coatings to your vehicle prior to having SunTek Paint Protection Film installed. Any waxes or coatings can interfere with proper adhesion of the film to the vehicle. How soon after installation can I drive my vehicle? In an ideal situation, an installer will have the vehicle 24 hours to monitor the film for any lifting edges before releasing the vehicle to the owner. In situations where this is not possible, we strongly recommend at least a 2-3 hour waiting period indoors followed by an inspection to ensure all edges are sealed before the vehicle is released. How do I remove SunTek Paint Protection Film? Film should be lifted at a 45-degree angle and pull towards yourself, this will cause the adhesive to release. Do Not fold the film over on itself and rip it off, this can leave adhesive behind. In cold weather environments we recommend a steamer to aid in softening the film/adhesive for removal. How does the self-healing work? SunTek Paint Protection Film contains a proprietary top-coat. This top coat protects the urethane against surface scratches. The majority of surface scratches will self-heal when exposed to heat – sun, warm panel (motor running), warm water, etc. We demonstrate this with a copper wire brush to simulate surface scratches that will self-heal such as surface dirt, sand, salt, etc. Will SunTek Paint Protection Film turn yellow? SunTek Paint Protection Film is protected against yellowing. Our top coat protects the Paint Protection Film against harmful solvents that are in gas, oil, bird droppings, car exhaust, etc. that can absorb into the film and discolor it. Will paint with and without SunTek Paint Protection Film fade differently? No. The area protected with SunTek Paint Protection Film will fade at the same rate as the unprotected area. Polarized sunglasses make Paint Protection Film look iridescent. Is this normal? This is purely an interaction between light reflected from car surface through the film and polarized glasses. Light reflected from the surface is polarized in different direction and each polarization propagates through the film differently. This is an inherent feature of the film as it gets oriented to some degree during the installation. A good analogy would be looking at a screen of an ATM machine in polarized glasses – you can see a normal screen when you look straight at it and then you tilt your head and see a black screen.